Appearing on ABC News this Sunday the 6th of August at 7:00pm Dr Gail Anderson will discuss Brachycephalic Obstructive Airway Syndrome (BOAS), breathing problems in short-faced dogs and other issues. There will be footage of Dr Anderson performing major corrective surgery on a young male British Bulldog at the Channel Highway Animal Hospital, interviews with his owners and of course camera time for the beautiful boy himself, Chad. Bulldogs, Pugs, Staffies, Cavalier King Charles Spaniels, French Bulldogs are all part of a group of dogs called brachycephalics or short-faced dogs. These dogs have been bred over generations to have shorter and shorter noses and rounder faces to resemble human like features. Their soft palates are now often too long extending into their upper airways. Their nostrils are often squashed becoming like vertical slits. These two factors restrict easy access of air into the airway causing increased effort of breathing and negative pressure inside the airway. This negative pressure can cause eversion of the saccules within the larynx and eventually laryngeal collapse and complete laryngeal obstruction and death. These dogs snore because their long soft palates vibrate in the upper airway eventually getting longer and thicker. This causes partial obstruction of the airway lowering available oxygen available and decreasing the dog’s capacity for exercise. Surgery can be done early to open up the nostrils and increase the ease of airflow into the nose. The soft palate can be shortened surgically to allow increased airflow into the larynx. This combination will allow much less turbulent airflow, decrease snoring and allow the dog to exercise more normally and avoid laryngeal collapse later in life. 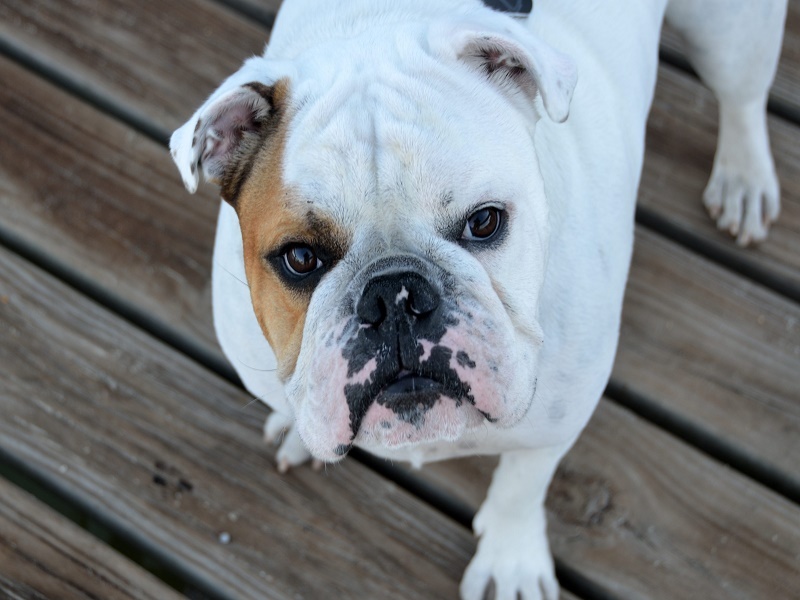 Bulldogs especially can also have small tracheas, or windpipes – this cannot be surgically corrected but the other procedures will help to lessen the effects of the small trachea in these dogs. Bulldogs have screw tails that contain misshapen vertebral bodies allowing a normally straight tail to curl in a circle. The tendency to have misshapen vertebrae can also appear in the spine in the chest causing spinal curvature deformities in both directions. These increase the risk of spinal cord compression with resultant paralysis or pain. Breeding dogs should be screened for spinal deformities before they are used. This can be done with plain radiographs of the spine.